Looking forward to tackling my next composition task of horror film motif! I've begun collecting reference material from prominent horror film soundtracks. More to come on that soon. In other news, I’ve identified some upcoming industry events, where I hope to make connections with filmmakers, game developers, and peers: Raindance Filmmaking Montreal’s Booze n Shmooze (this is a monthly event, I'll be attending tonight), GeekFest (November 4-5), MIGF (Montreal Independent Games Festival) which is happening as part of MEGA (Montreal Expo Gaming Arcade, November 17-18-19), and MIGS (Montreal International Games Summit, December 11-12). A hugely important part of becoming a successful new media composer is networking and building relationships, so as I develop and diversify my portfolio, I know it is also time for me to put myself out there and continue making these important connections. As I mentioned in my first post, I’ve been composing for the upcoming gravity-shifting virtual reality game Gravitas, from Enthusiast Games, and work has been going well! After much back and forth with the devs, the creator and lead developer came over last week and we finally sat down together to truly begin inputting some music cues into the game engine. So that was very exciting, I can’t wait to get back in there. My next big steps for Gravitas are to finish the music design document (though this will evolve over time, as the game itself evolves), and to compile a list of each individual music cues involved in the project, their type (intro, loop, stinger, tag, transition), their approximate length (e.g. 15-30 seconds), any notes relating to the cues’ purpose(s), as well as potential tools and resources to be used. 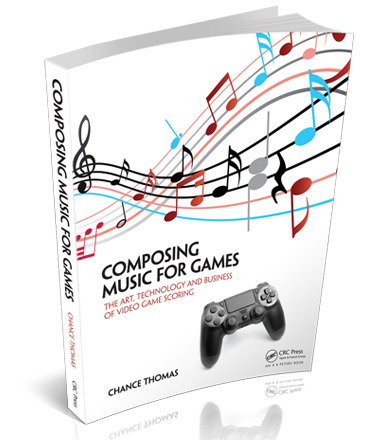 I’ve been reading this incredibly insightful book, Composing Music for Games: the art, technology and business of video game scoring, by acclaimed game composer Chance Thomas. This book had been of so much help in guiding me towards smarter, more informed ways of writing music for Gravitas. Throughout the book there are plenty of “guest lecture” side panels where other game composers will offer insight into the material relevant to the chapter. I’ve recognized many of these guest “lecturers” from my experience listening to game soundtracks, as well as from my research into game music. One such person is Montreal-based Benedicte Ouimet, Music Supervisor at Ubisoft Montreal, whom I would be thrilled to intern under. After conducting some more research I plan on reaching out to her for a potential apprenticeship at Ubisoft. Lastly for this blog entry, I have been perusing distinguished composers' websites, with the intention of identifying common desirable elements, so as to improve my own website here. I plan on assembling a list of all the composers I greatly respect, and doing a more thorough and formal analysis of their websites, which will appear on this blog in a future entry. In the meantime, I do plan on reconfiguring the layout of this site, especially the Portfolio and Blog pages, to be better suited for browsing through the various playlists and blog entries. Thanks for reading! Stay tuned for the upcoming entry on my venture into the world of horror film music!